Royal Wheels India is an adventure travel group organising Trivandrum Tours Package. The State Capital of Kerala is famous for its historical temples, museum and a long shore line, with internationally renowned beaches, backwater stretches, and a rich cultural heritage. Thiru-v-anantha-puram is a three sylable name meaning the abode of the sacred snake god "Anantha". Lord Vishnu of the ancient Indian mytholgy rests on this huge serpent. 50 km from Trivandrum, is one of the famous and upcoming beaches in South India. 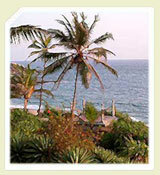 Varkala is famous for its quiet secluded stretch of sand. 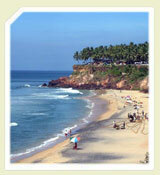 The Papanasam beach in Varkala is known for its mineral springs and rocky cliffs. The 2000 year old Sree Janardhana Swamy temple and the Nature care centre are the two main attractions here. Varkala is also an important Hindu center of pilgrimage. The final resting-place of the great social reformer, Sree Narayana Guru, is near Varkala, atop a hill called Sivagiri. 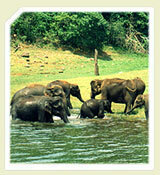 Periyar Tiger Reserve, one of the famous Wildlife Sanctuaries in India, spread across 777 Sq. Kms out of which 360 Sq. Kms is thick forest, is one of the best places for viewing wild elephants. There is a 26 Sq. Km. artificial lake formed by the Mullaperiyar Dam across the Periyar river. A boat cruise on the lake is a great way to watch the wildlife.